It’s the most wonderful time of the year, and we’ve also seen some wonderful examples of creative home decor in our blog posts this month. If you missed my post on our latest antiques container that just arrived from France and our holiday discount, then I hope you’ll go and have a look at the link. We have some beautiful pieces of antique furniture and we’re still unpacking it all! 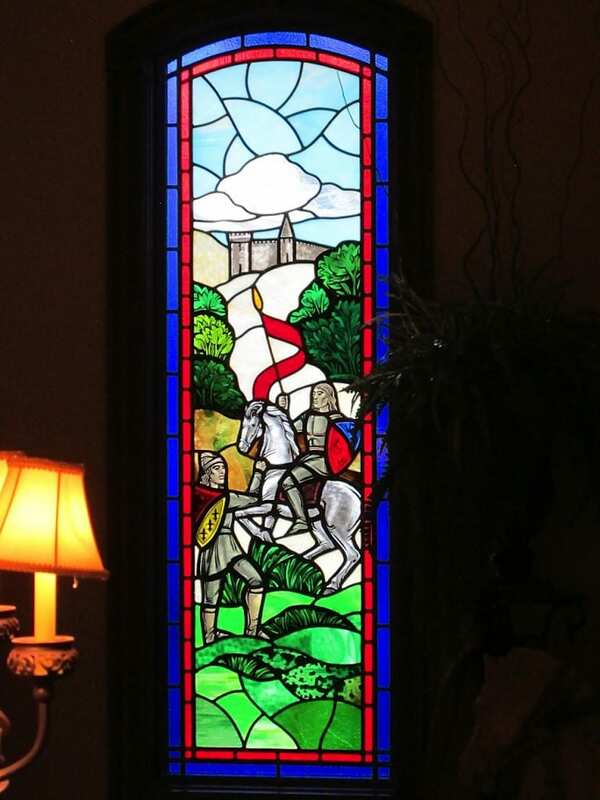 Among our favorite antiques and creative home decor blog posts from November, our story about Bob H.’s Renaissance Knight Buffet, Mural, and Window has to be one of the most memorable. 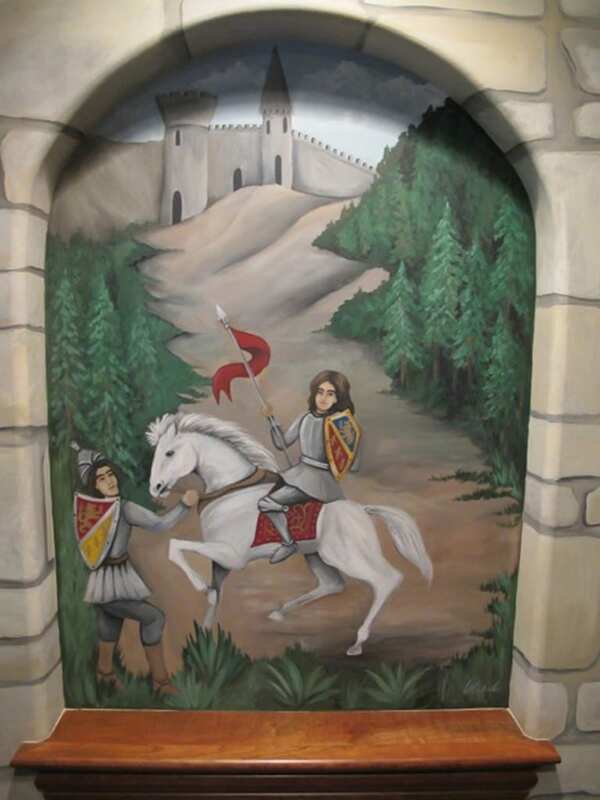 Bob was so inspired by the Renaissance knight on horseback carved on an antique buffet he bought from us, he had a mural made to match, and then a matching stained glass window for his impressive foyer. 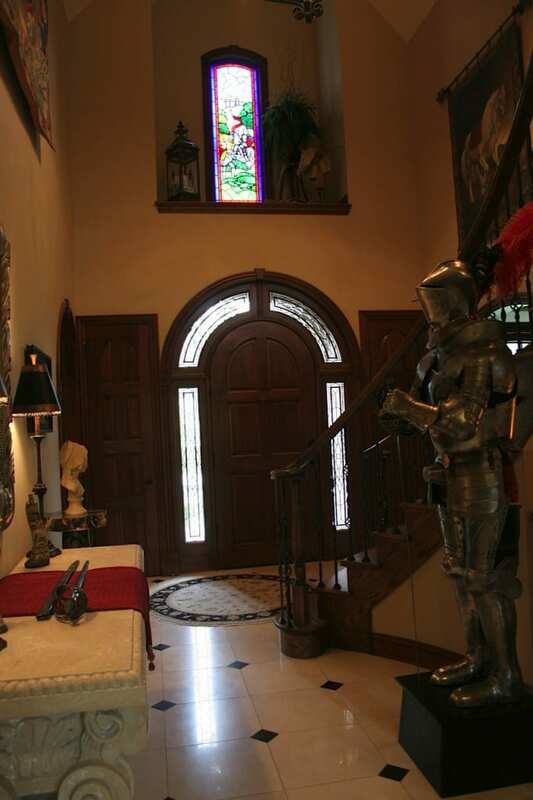 His Illinois home evokes European castles so the Knight theme is fitting. 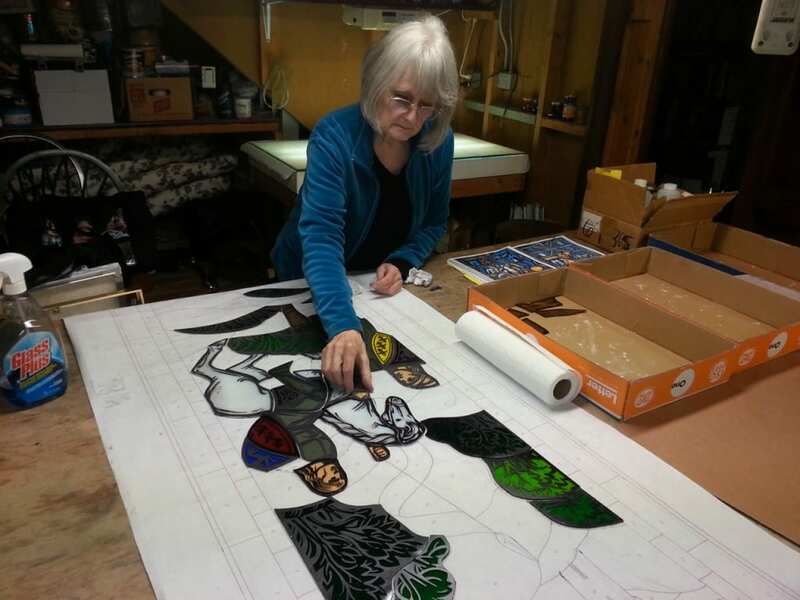 See the mural, window details, and more photos of Bob’s home in this blog post. 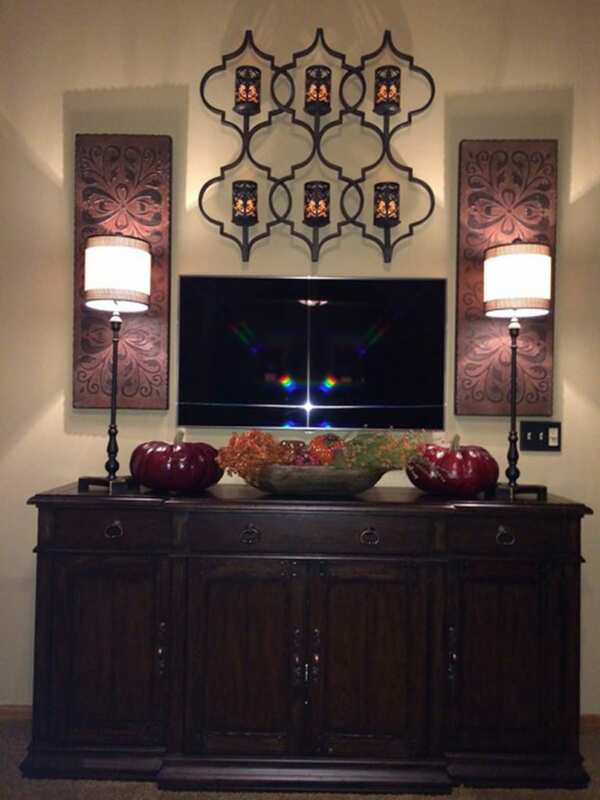 In another in our series of client spotlights, Amy B. in Wichita, KS, got in touch to show us photos of the Ambella Home Aspen sideboard in Amy’s home. She bought the sideboard from us earlier this year and did a wonderful job in accessorizing it. For readers who are getting ready to redecorate soon, I shared some creative home decor ideas in my stories on Classic Painted Floor Designs and Red Wine Colored Decor. Whether you are painting floors or walls, I hope that you find some useful inspiration! 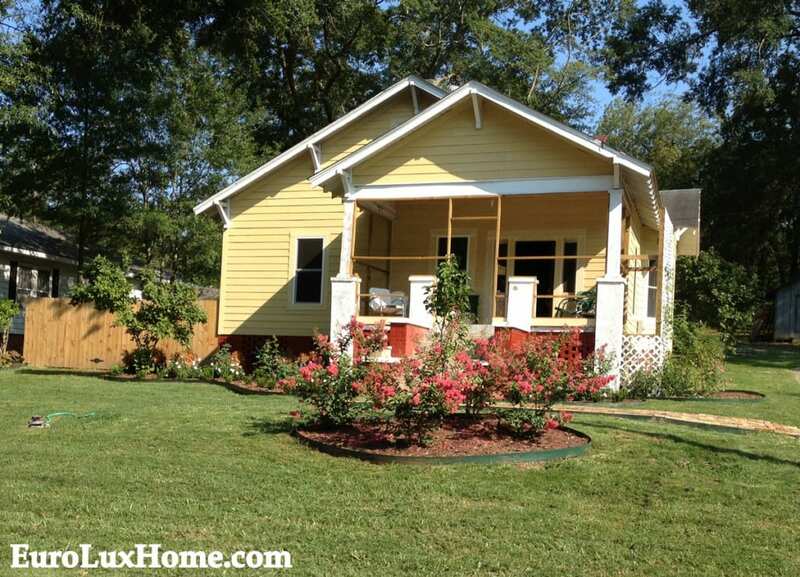 The most exciting story for us personally this month is that we finally moved into our our 1920s vintage bungalow. Regular readers of this blog know that Greg and I have been renovating our darling 1920s bungalow (a.k.a. The Money Pit) since we bought it in October 2011. That vintage house has had a complete makeover from top to bottom since then! We’ve shared our Vintage Life Bungalow Renovation stories along the way, and we still have plenty of work ahead of us. We’ll share that with you too. But for now, as we moved into the house just before Thanksgiving, we are just very thankful to be living in our new home. I look forward to sharing more creative home decor news with you through the month of December, and hearing about your own antiques and creative decorating too! 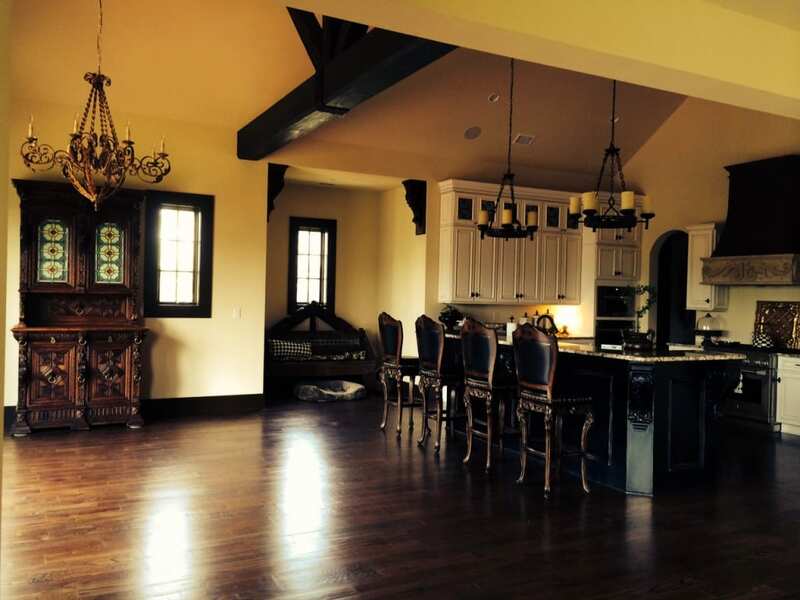 This entry was posted in Home Design Ideas, News and tagged 1920 Bungalow Renovation, Ambella Home, antique buffet, antique French furniture, Antique Furniture, Antiques Shopping, creative home decorating, discount, high quality reproduction furniture, interior design, old house renovation on December 3, 2014 by admin. I first heard from Brittany through our EuroLux Etsy store. She mentioned she was looking for furniture with lions and I told her she had come to the right place! She and her husband Greg drove over from Charleston, SC, in order to pick out a few pieces for their beautiful brand new home, which looks like it was plucked right out of the Loire Valley in France. 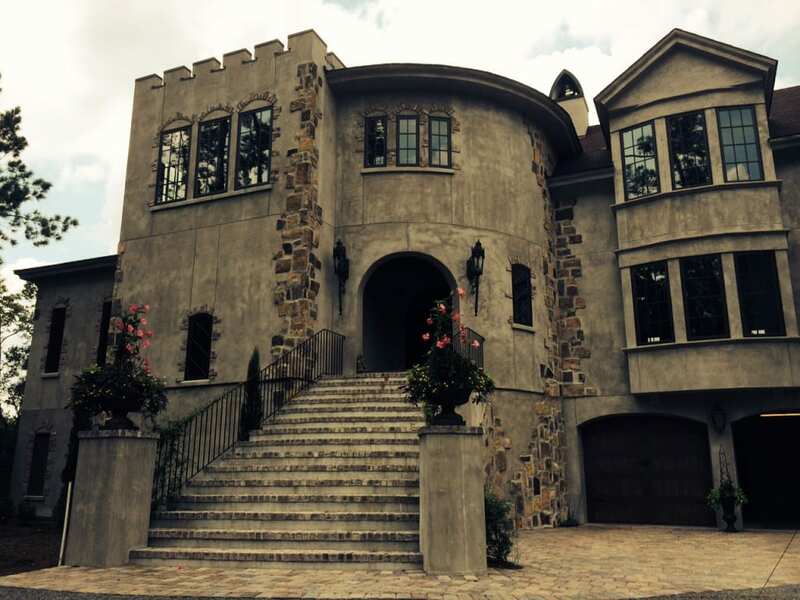 Outfitting your own castle is a big job! Brittany and Greg are just getting started, but they want to take their time and find just the right antique pieces that speak to them. The first piece that said, “Bring me home!” was a gorgeous antique Mechelen stained glass buffet with lots of carvings and lion’s heads. The buffet dates to 1900 and it boasts the original red, green and amber stained glass doors with a floral design. The winged lions on the side supports are exceptionally pretty and the high-quality carvings on both the upper and lower cabinets of this buffet include many regal lions’ heads, some with a brass or gold toned ring, as well as male and female figures and faces. Its new home is in the dining room just off Brittany’s gorgeous kitchen. 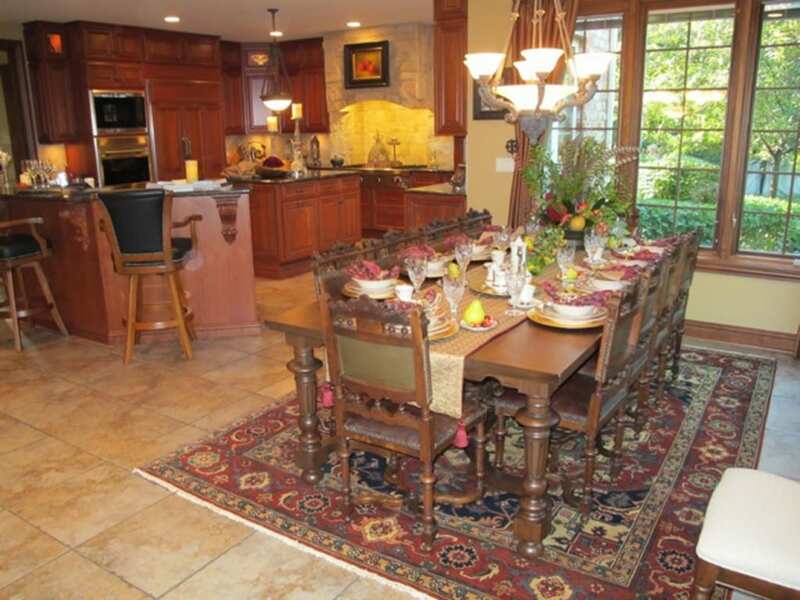 The large dining table and chairs haven’t arrived yet, but you can imagine how grand the dinner parties will be! The view from the kitchen and dining room looks out over an inter-coastal marsh – imagine the beautiful sunsets Brittany and Greg will enjoy while dining. 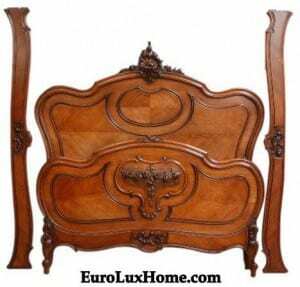 Eventually Brittany and Greg will find the perfect piece of art or perhaps a gorgeous mirror to go over the French 1880 sideboard. 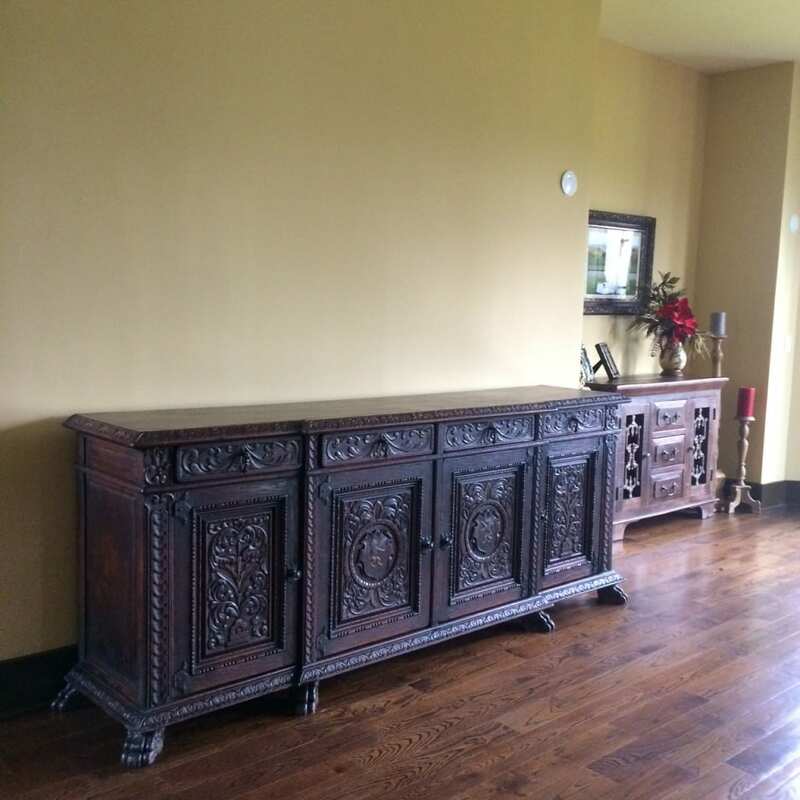 Here’s another view of the antique Mechelen buffet. It looks so splendid against the rich wood floors and that ornate chandelier. We love that Brittany and Greg are taking their time and filling their home with just the right pieces rather than buying everything at once. A layered, lived in look is so much more interesting. And in November, Brittany and Greg are expecting little Italia – baby will make three in their castle by the sea! We wish you both a big congratulations and will keep an eye out for more gorgeous pieces for your beautiful home! 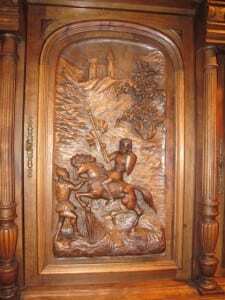 This entry was posted in Client Spotlight and tagged antique buffet, antique French furniture, Antique Furniture, Antique Renaissance furniture, Antique Sideboards, French Renaissance Sideboard, Heavily Carved Antique Furniture, Mechelen, Mechelen Style Antique Furniture on August 27, 2014 by admin. Greg and I are busy spring cleaning and sorting out some of our older inventory, which means you can pick up some great antiques deals as we cut prices on pieces that are still waiting for a good home! If you’ve had your eye on something you liked, now is the time to mosey on over to EuroLuxAntiques.com and see if we’ve reduced the price. Discounts on selected treasures are mostly around 40% off – sometimes more! Our spring cleaning antiques deals include furniture, vintage lighting and other smaller items and decorative accents too. Although spring cleaning usually sounds like a chore, we’re really enjoying sorting through our stock. We always pride ourselves on our good value, but during the 10th anniversary year of our business we’ve got even more excuse to say ‘thank you’ to our cherished customers with some superb antiques deals. For example, this fine antique French Renaissance Henry II buffet dating to 1900 has been significantly reduced to $2,820. When you consider the price of a modern buffet or serving hutch, we think that this beautifully carved oak antique buffet is a steal! At nearly nine feet high and six feet wide, the large Renaissance style buffet offers tons of serving and storage space, including a full-length plate rack. 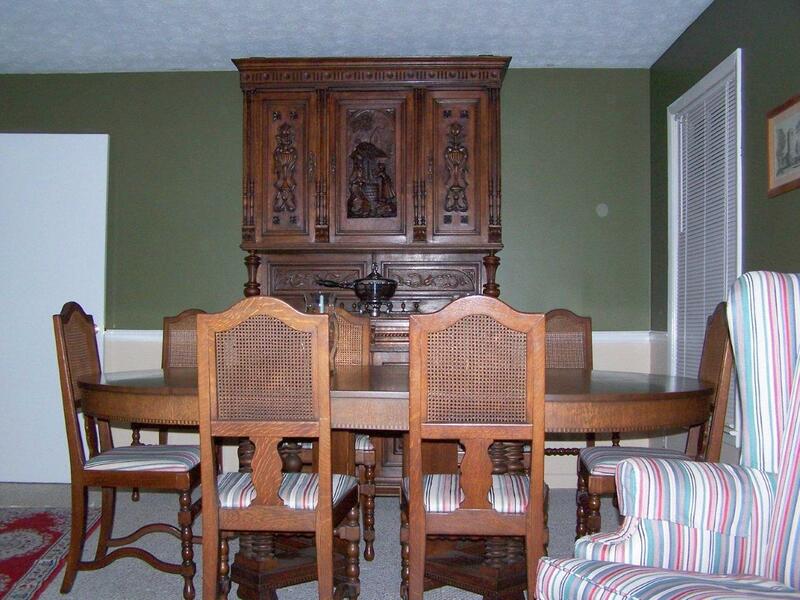 The swags and floral and medallion carvings on the doors make this a very nicely crafted piece. I’m sure that someone with a taste for romance will quickly snap up this amazing French vintage Rococo chandelier in the Marie Theresa style. One of my favorite spring cleaning antiques deals, the sparkly glass and metal 6-arm chandelier drips with clear jewel pendants and it’s studded with pretty rosettes. Delightful for a bedroom, foyer, or even a fancy master bath, the 25″ high vintage chandelier has now been ‘spring cleaned’ down to $580. That’s nearly half price! Smart investors might take note of this very rare antique clock signed by the famous clock manufacturer Nicholas Mueller’s Sons. The intricate antique Rococo clock is dated April 25 1882 on the works and it still runs and strikes the hour too! The highly detailed sculpture of a woman carrying wheat and feeding a lamb is probably the Greek goddess Demeter or the Roman Ceres, both goddesses of the harvest and fertility. We’ve slashed the price of the metal and black marble Nicholas Mueller’s Sons clock to $2,610. I might regret it tomorrow, but for now I’m in spring cleaning frenzy! I’m even taking a clean sweep to selected antique and vintage Delft, Majolica, and ceramics. I’ll miss some of these lovely pieces as they are so decorative around the gallery, but I’m consoled by knowing they will brighten someone’s home! 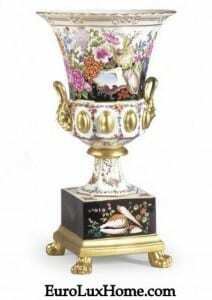 To see all our spring cleaning antiques deals, browse our online EuroLuxAntiques.com gallery. The final discount price doesn’t always show on the home page, so click through to the individual item details to see the lowest spring fling price! Don’t forget our always-free shipping in the Continental US and much of Canada. Happy shopping and happy Easter! Aimee owns EuroLuxAntiques.com with her husband, Greg. Aimee sources amazing antique furniture, vintage lighting, & high-quality reproduction furniture to help her customers decorate their homes in a unique way. She loves her 8 (you read that right) fuzzy children and is renovating a 1920s bungalow in South Carolina. Connect with Aimee on Google+ or you can sign up here to receive this blog in your inbox. This entry was posted in Antique Clocks, Antique Furniture, News and tagged Antique Blue Delft, antique buffet, antique ceramics, Antique Clocks, antique french buffet, Antique French Renaissance Henry II Style Buffet, Antique Furniture, Antiques Shopping, discount, French Antique Furniture, Nicholas Mueller's Sons antique clock, Vintage Blue Delft, Vintage Delftware, Vintage Lighting, Vintage majolica on April 19, 2014 by admin. That’s right – 15% off everything! We love our customers so much that we’re sharing the Valentine’s Day love with a customer appreciation sale. But you have plenty of time to spend with your sweetheart and shop for a sweet deal. You can get our special Valentine discount now through Monday February 24, 2014. Get 15% off everything at EuroLuxAntiques.com (as well as our always-free shipping) when you enter the coupon code at checkout: WeLoveYou! That’s 15% off your entire order, on everything from fine antique furniture and reproductions to home decor accents. Consider it our Valentine’s gift to you. Need inspiration? These ideas will surely seduce you into treating yourself, your honey, or your home! 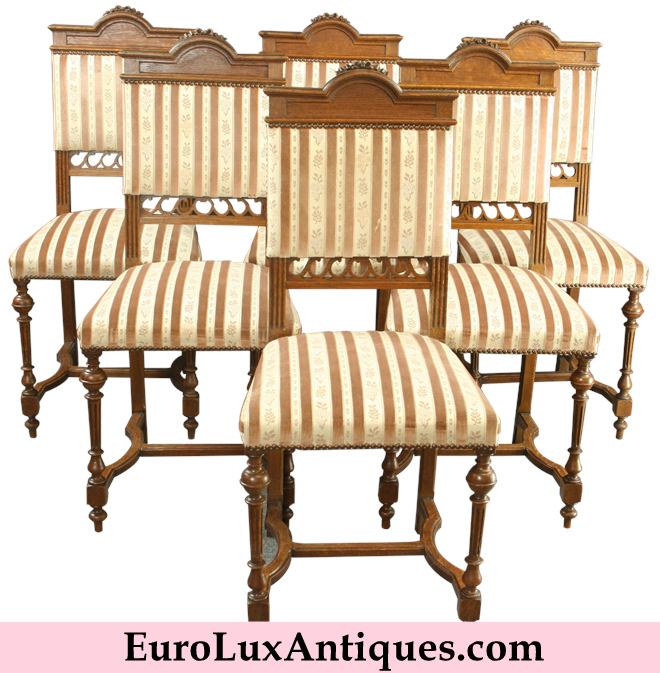 This set of 6 French antique Louis XVI style dining chairs dating to 1920 looks so romantic with pink striped upholstery. Velvety ribbons and floral damask on the delightfully carved solid oak chairs make them perfect for a traditional home… and a modern romance! Or maybe you want to light up someone’s eyes with a fabulous antique chandelier or a beautifully crafted new Dale Tiffany lamp? The 15% off code is valid on all our fine antique and new lighting. 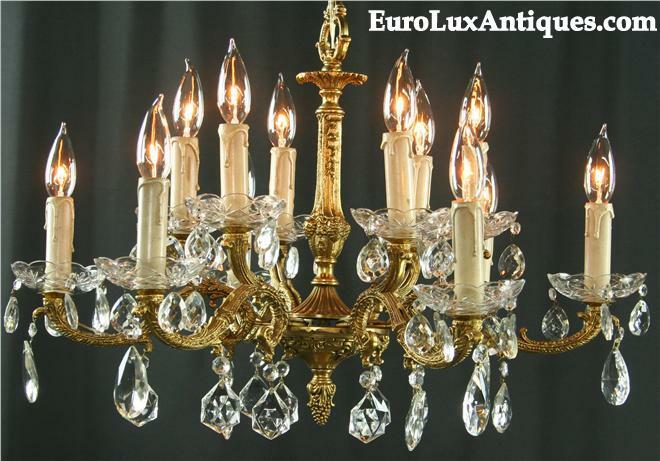 For example, this vintage French chandelier will make your heart beat faster if you love the glamour of Rococo style. Dating to 1950, the 12-arm chandelier is crafted of rich gold-tone metal. Electric candles sparkle against cut glass cups and chunky glass pendants. This very affordable chandelier offers tons of luxury for the price, and it’s a big beauty at 28″ high. Detailed carvings of florals, feathers and fans give this antique 1900 French walnut buffet a wonderfully elegant decorative effect. 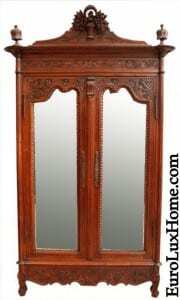 The nine-pane lead glass central door creates the perfect spot to display your fine China or collectibles too, and the plate rack could also be used to hold antique books. For a smaller piece, we love this very nice Art Deco Madonna and Christ Child statue dating to 1930. The Madonna stands more than a foot tall, with beautiful blue and white coloring on her robes. Our price is only $117 before the 15% off discount for this stunning Madonna. It would make a lovely gift for your wife for a wedding anniversary gift, or for mom (everyone’s other sweetheart) on Mother’s Day. Or browse our selection of other antique religious treasures. Perhaps you’ll fall in love with a new piece from Jonathan Charles Fine Furniture or the Ambella Home Collection. We carry their high-quality reproduction furniture as the craftsmanship, finish, and fabulous designs meet our high standards. Now you get 15% off our already low prices! 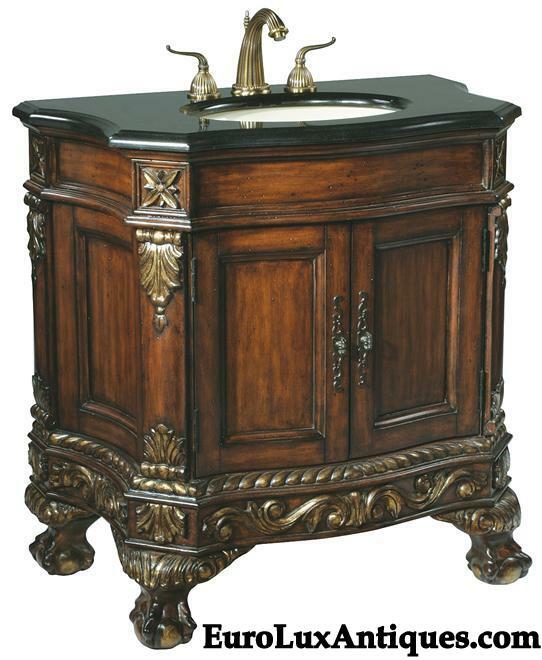 The stately styling on this Ambella Home Ball & Claw sink chest is a great match for our antiques-loving customers. Gold highlights glow against the lavish carvings in rich mahogany. It’s all finished off with a black granite top and porcelain sink. For more inspiration, browse our complete inventory. Then take 15% off everything in your shopping basket when you enter the coupon code: WeLoveYou! The offer is valid until February 24, 2014. Happy Valentine’s Day and happy shopping! 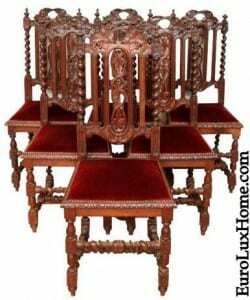 This entry was posted in Antique Furniture, News and tagged Ambella Home, antique buffet, antique chairs, Antique Furniture, antiques, Antiques Shopping, coupon code, dining chairs, discount, French antique dining chairs, French Antique Furniture, Jonathan Charles, lighting, Valentine's Day, Vintage Lighting on February 13, 2014 by admin. 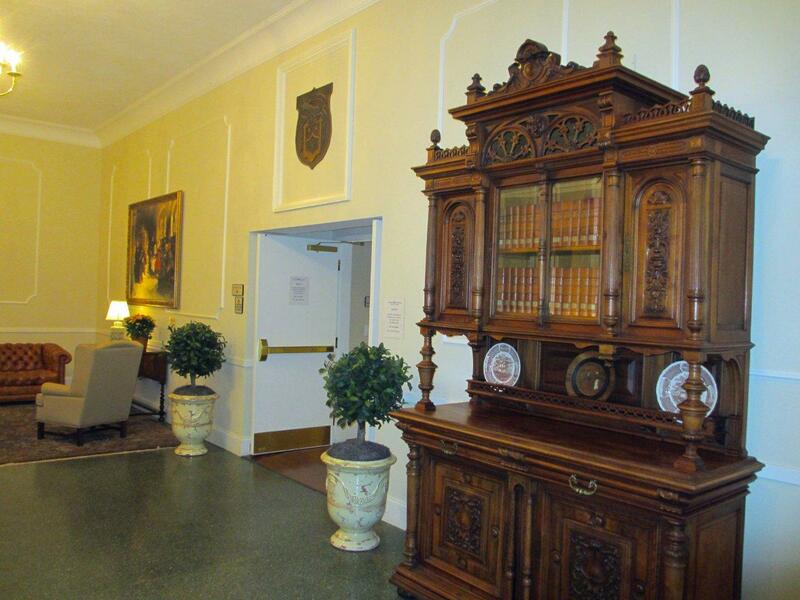 Mary Ann H. contacted me to help her find an exceptional and impressive antique buffet for the lobby of the Gordon-Conwell Theological Seminary in Boston, MA. 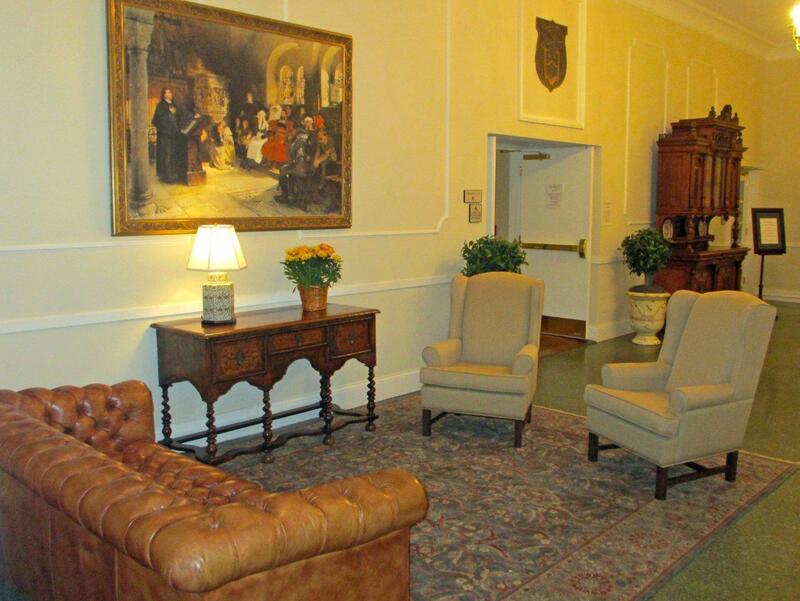 It’s one of the largest evangelical seminaries in North America and a donor had graciously given funds to decorate the lobby. 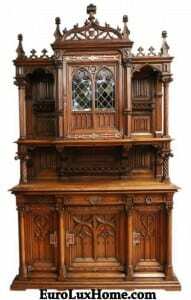 We looked at all the antique buffets and sideboards in our gallery, and recommended this gorgeous Henry II Renaissance-style buffet dating to 1900. 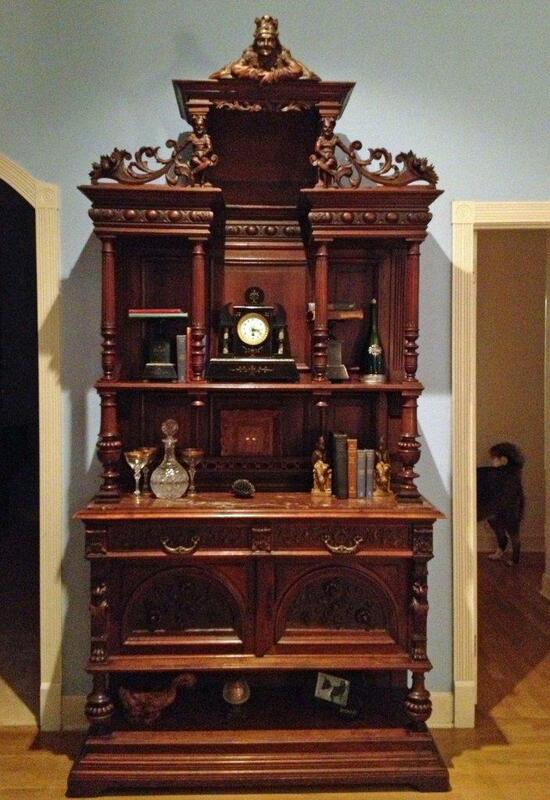 The French buffet is a stately nine feet tall, carved in walnut with a wonderful, warm patina. 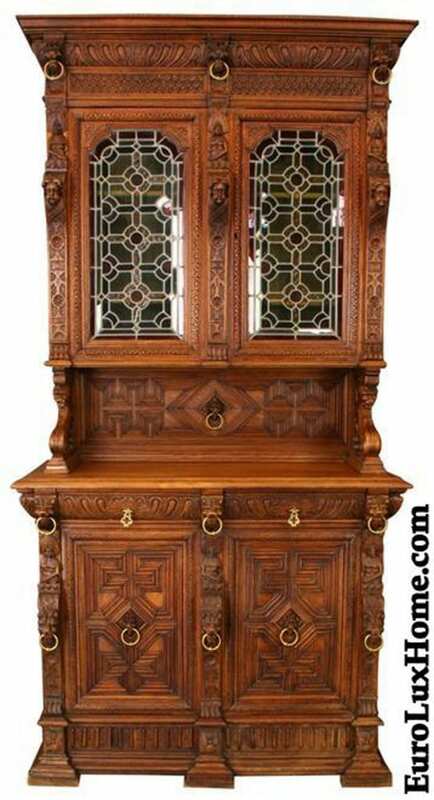 The antique buffet boasts elaborately carved details including coats of arms, urns and floral accents on the doors and pediment. 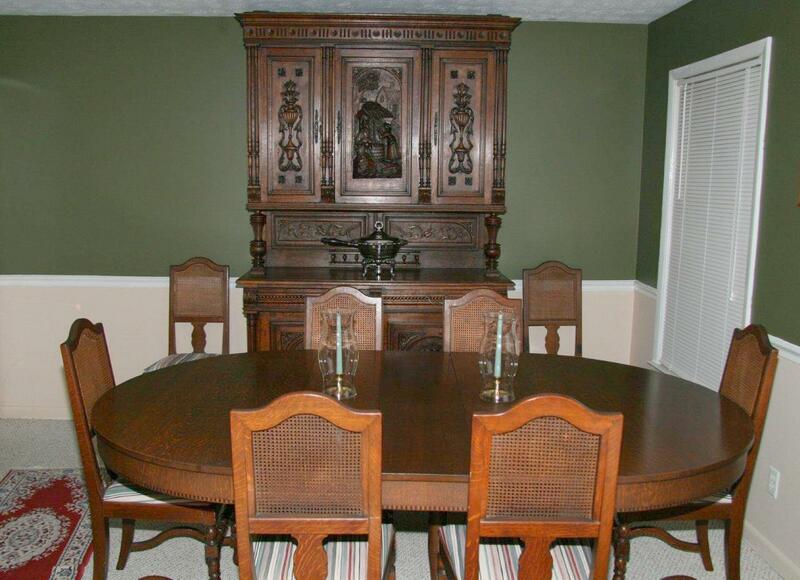 Scroll cut railings, fluted posts, and pine cone finials add to the buffet’s majesty. 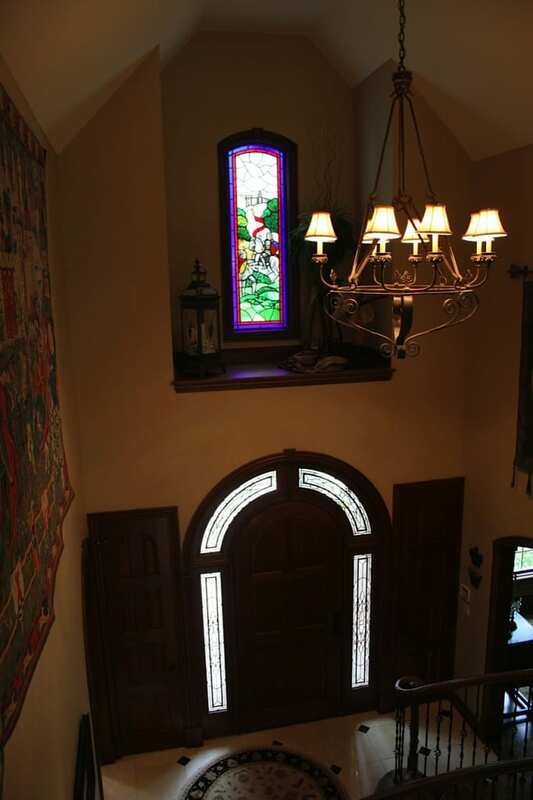 The carved head of a Renaissance courtier smiles down above the glass-front center door. Thanks to its height and substance, the antique buffet stands proud to fill even the largest space. It was the perfect choice for a classic and dignified lobby area! On the other side of the room, Mary Ann placed a classic Chesterfield sofa with traditional upholstered chairs. 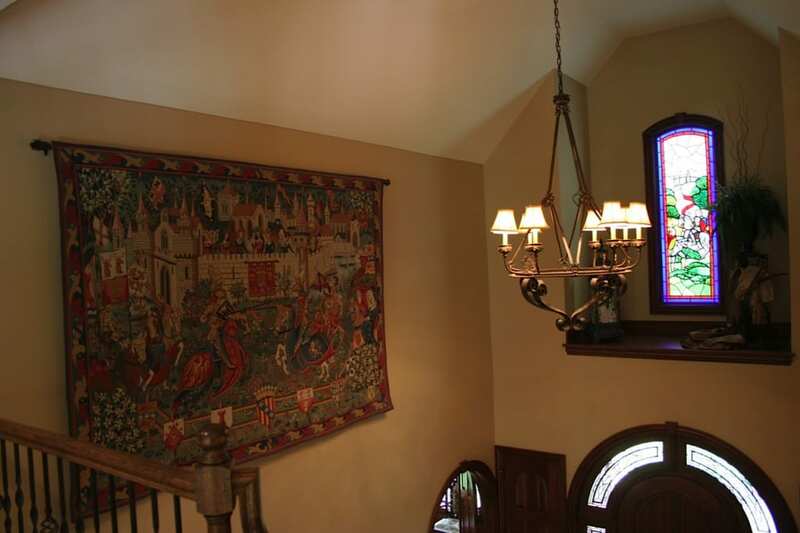 She also added an interesting barley twist console table over an Oriental rug with soft, muted colors. The whole interior design of the lobby is elegant and inviting. 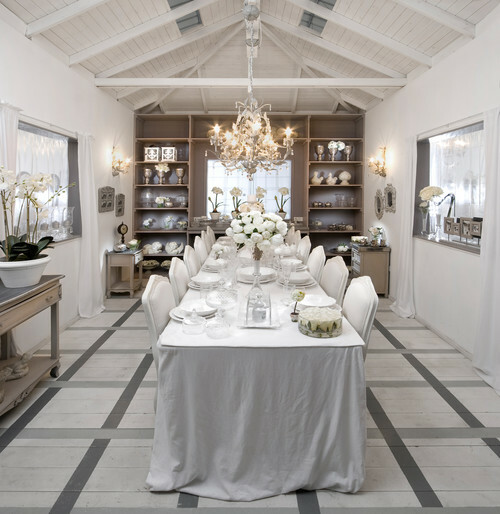 We are delighted that the more than 100-year-old antique buffet found such a beautiful and inspiring place to spend its next century! 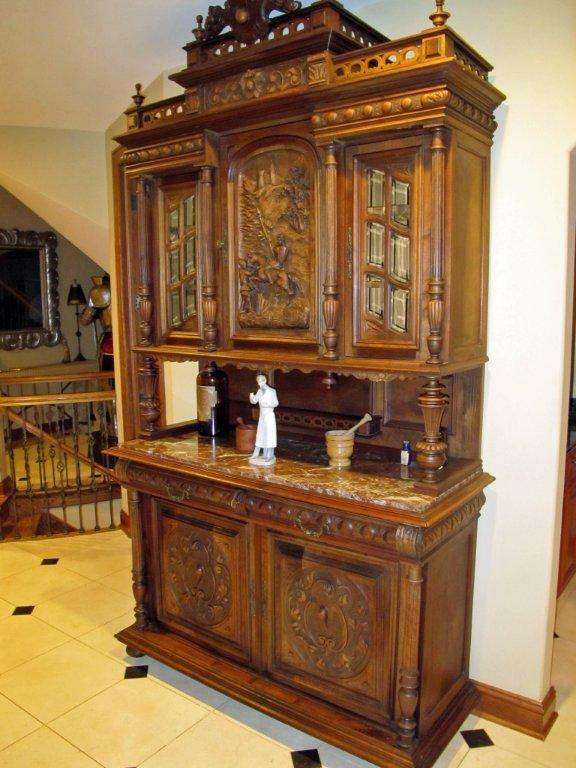 This entry was posted in Antique Furniture, Client Spotlight and tagged antique buffet, Antique French Renaissance Henry II Style Buffet, antique Renaissance buffet, antique server, French Antique Furniture, French Renaissance Sideboard, Heavily Carved Antique Furniture on October 24, 2013 by admin. We covered an eclectic mix of subjects in our September blog posts, including spotlights on antique dining room furniture in two clients’ homes, a tutorial on how to mend broken ceramics, and a fun celebration of Elvis Presley. I guess that is fitting for the harvest season, as we gather in all the fruits and veggies and enjoy an abundant and diverse feast! We certainly took inspiration from the wide range of creative options in our item on decorative stair ideas. Check out the photos in the post and tell us what you think! Let’s revisit some of our other most popular September posts. It’s always great to see photos of our customers’ homes, featuring antique furniture and other home decor accents they’ve bought from us. 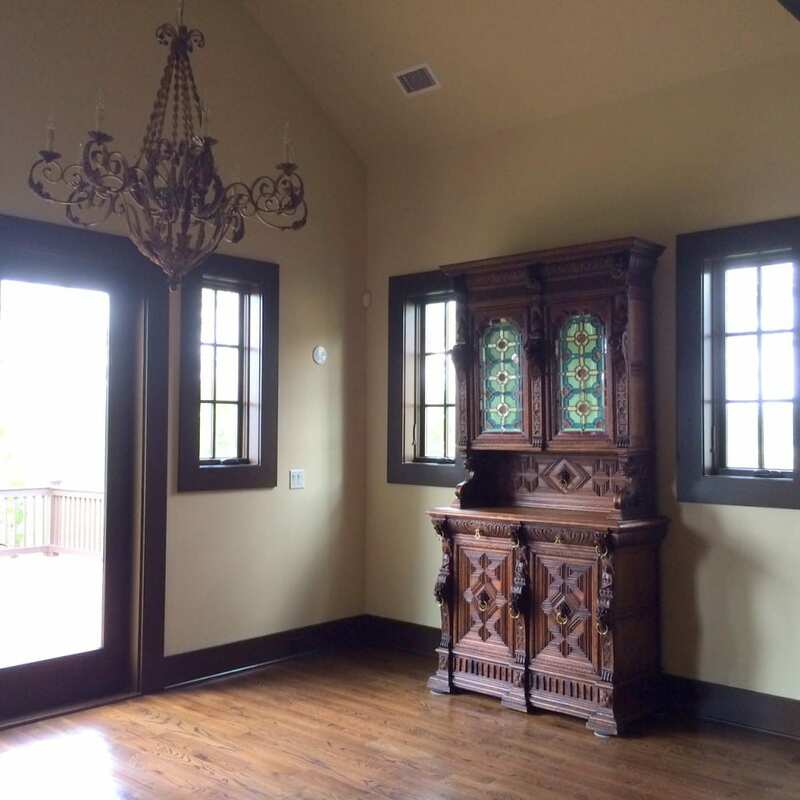 Our client spotlights are a great source of home design ideas and beautiful ways to blend antiques into decor. This month we got a glimpse of Susan’s gorgeous red dining room, featuring 12 Renaissance dining room chairs she found in our gallery. 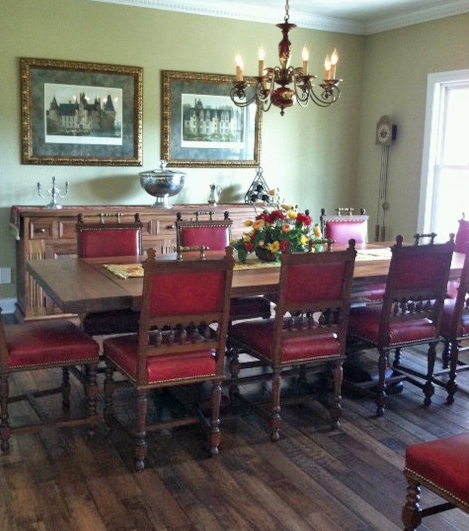 Susan reupholstered some of the chairs and she also bought a vintage chandelier to hang over the dining room table. The red ceramic Hubert Bequet chandelier is the perfect finishing touch and it proves that a relatively simple decor accent can really pull the whole look of the room together! 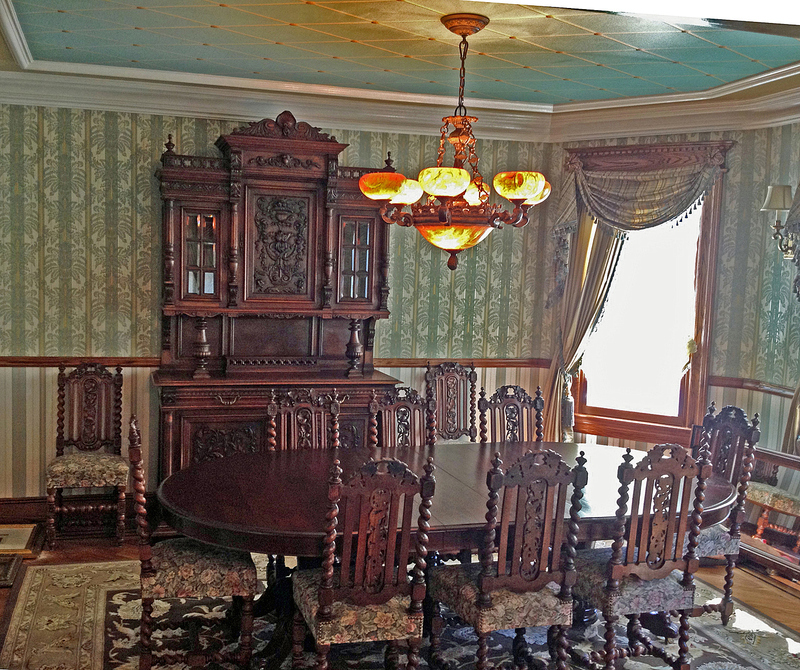 Continuing the antique dining rooms theme, we looked at the Victorian dining room of our client Sal S. in New York. Sal is a busy entrepreneur and he is restoring a Victorian house with the help of an interior designer. 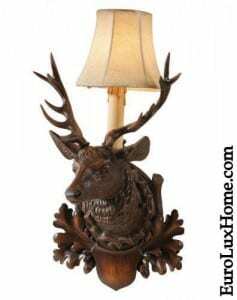 The designer suggested Sal check out our online antiques store. Sal went one better, and drove all the way to South Carolina to visit our gallery in person. Thank goodness the shopping trip proved successful! 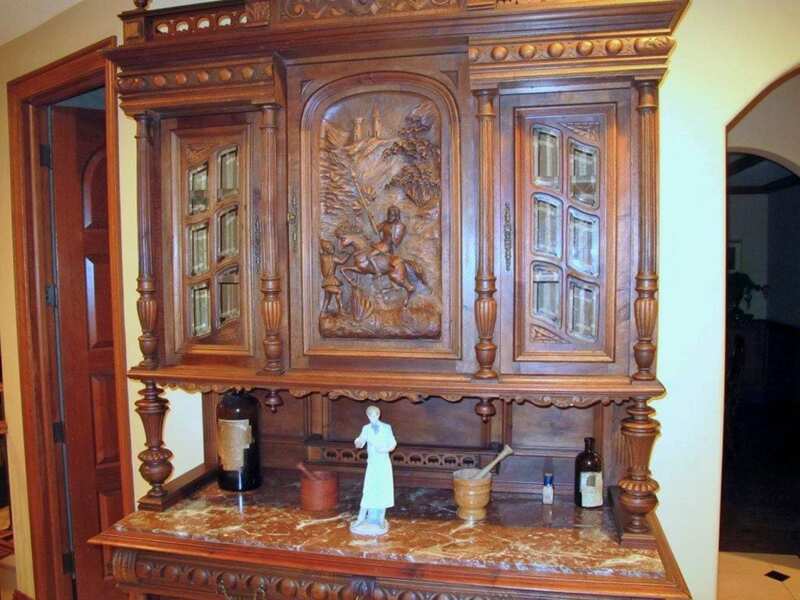 Sal added an antique French Renaissance Buffet, ten upholstered Hunting chairs, and a Renaissance style server or sideboard to his Victorian home. From a Victorian restoration to ceramic restoration… In our blog post on How to Fix a Broken Ceramic, Kathy gave a video tutorial, using a broken ceramic figurine as an example. The figurine, a.k.a. Prudence, belongs to a friend of ours and poor Prudence had a broken arm. Kathy did her magic and repaired Prudence, sharing her ceramic-fixing tips in a short video as she worked. Those tips are also written up in the post if you prefer to read them. We enjoyed a celebration of Elvis Presley this month, as Greg and I recently visited Tupelo, MS, for a furniture show and stopped in to see Elvis Presley’s birthplace. You can see our photos of Elvis’ childhood home in the post. 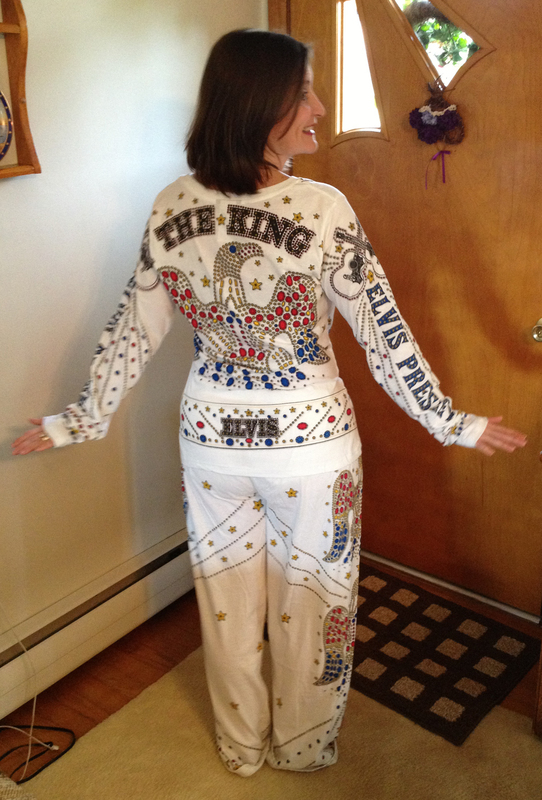 Whilst there, I bought these awesome Elvis jumpsuit pajamas in the gift shop. So when the South Carolina Elvis Festival came to our town of Newberry a few weeks later, I already had the perfect outfit to celebrate Elvis The King! Thanks for sharing September with me. We’ve got lots more to say about home decor, antique furniture, and living it up, vintage style! Sign up here to receive our blog posts, and you can follow us on Facebook too! 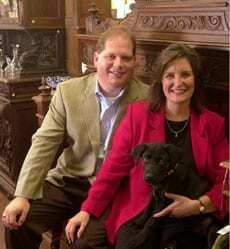 Aimee owns EuroLuxAntiques.com with her husband and best friend, Greg. Aimee sources amazing antique furniture, vintage lighting, & high-quality reproduction furniture to help her customers decorate their homes in a unique way. She loves her 8 (you read that right) fuzzy children and is renovating a 1920s bungalow in South Carolina. Connect with Aimee on Google+ or you can sign up here to receive this blog in your inbox. This entry was posted in Antique Furniture, News and tagged antique buffet, Antique Furniture, antique Renaissance buffet, Antique Sideboards, ceramic restoration, dining chairs, home decor, how to blend antiques into decor, how to fix ceramics, living with antiques, red dining room on September 27, 2013 by admin.